With fall in full swing here in Northern Michigan, I'm starting to get nostalgic for those long summer days, sitting by the water with my two little ladies, and playing barefoot on the lawn. But one of my favorite memories from this summer was my time teaching at La Petite Bloom Workshop in Leland, Michigan. 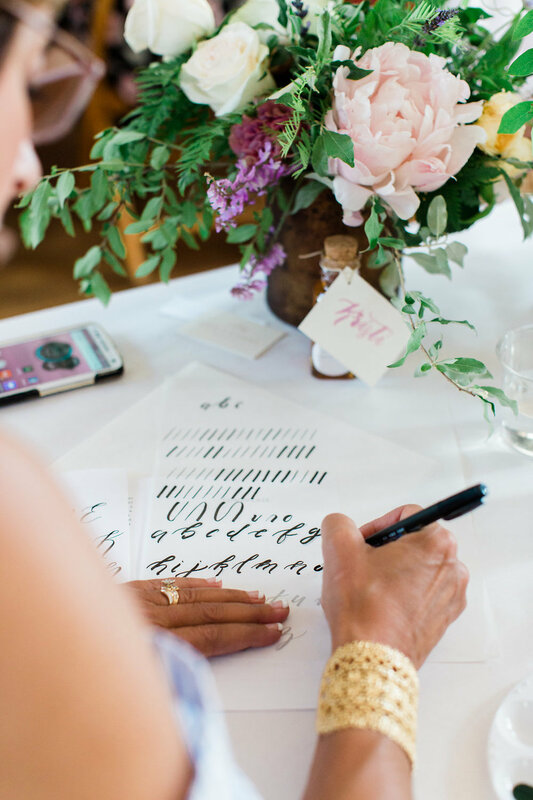 It was the most beautiful day, filled to the brim with tips for growing a creative business, how to perfect your hand-lettering skills, and how to arrange a stunning flower arrangement. Here I am with the amazing ladies who made the day possible: (from left to right) me, Sam of Bloom Floral Design, Ashley of Ashley Slater Photography, Michaela of Michaela Noelle Designs, and Jen of Bloom Floral Design. 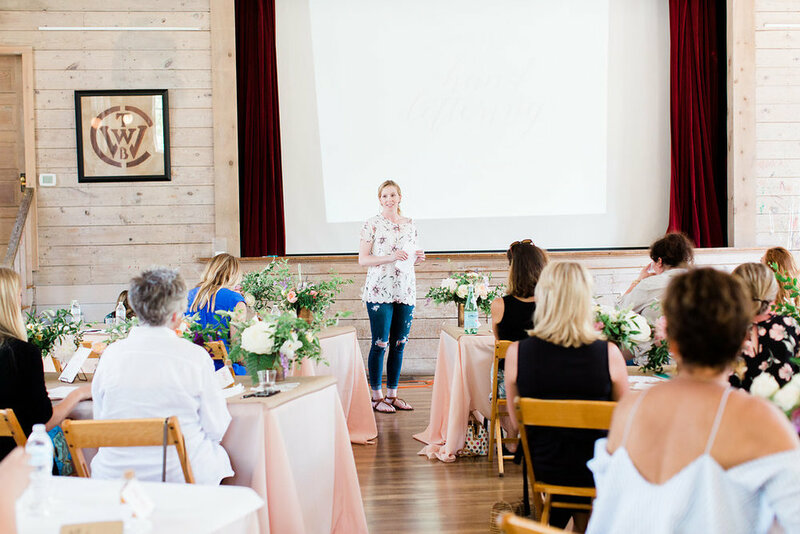 Ashley & Michaela started The Bloom Workshop a few years ago with a mission to create a space for women to come together to create beauty. How cool is that? They tour the country hosting workshops in different cities, inviting different creatives to be guest teachers, and giving women the opportunity to learn new skills, network with other like-minded people, and have fun just being creative. 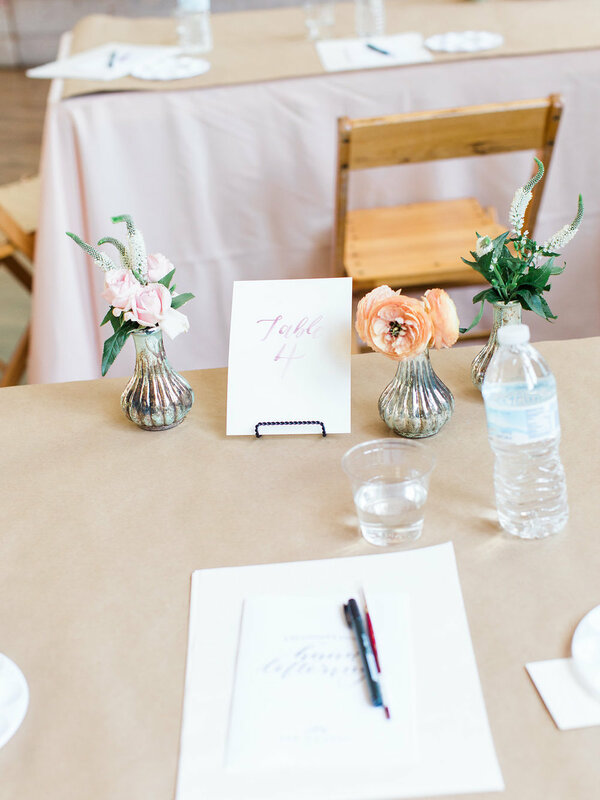 Michaela & Ashley did an amazing job creating a stunning space to learn, which featured blush tablecloths, petite floral arrangements, and hand-painted watercolor table numbers. 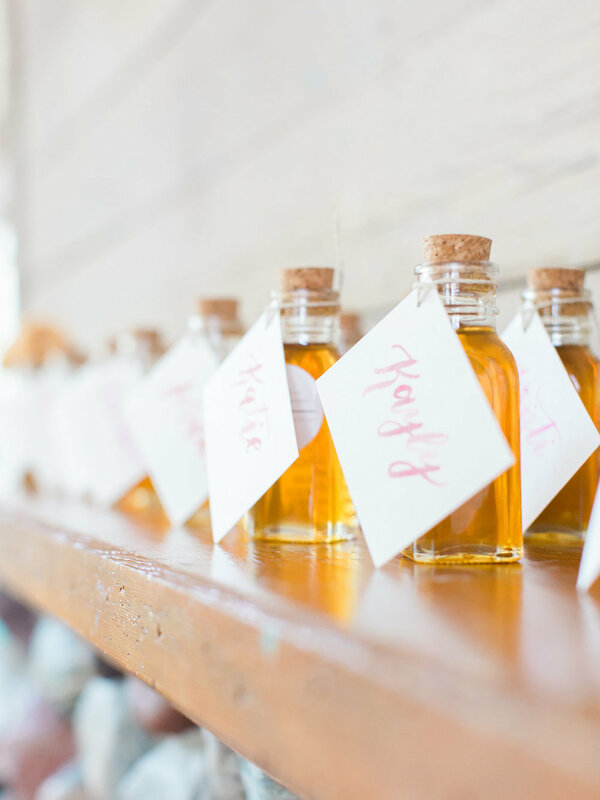 There was a dessert bar filled with sweet treats and pink lemonade, and each guest went home with a beautiful personalized jar of local honey. In the first segment of the workshop, we all were lucky enough to learn the art of floral design from the incredibly talented Jen of Bloom Floral design; from trimming the beautiful peonies and roses, to putting our new found floral arranging skills to work to create stunning and unique bouquets to take home from the workshop. My hand-lettering portion workshop featured lessons on both brush pen calligraphy, and watercolor brush calligraphy as well as a watercolor flower painting tutorial. The workshop began with the fundamentals of traditional calligraphy, practicing the basic shapes and formations with a brush pen, and then expanded on how to apply those skills to modern hand-lettering and watercolor brush calligraphy. It was so fun to see everyone pick up the techniques quickly and put their own twist on their lettering style. We then dove into a quick lesson on watercolor botanical paintings, and I taught the group the difference between wet-on-wet painting and wet-on-dry painting. Everyone's paintings were so beautiful and unique, and it was really fun to see all of the ladies take home a piece of original artwork at the end! 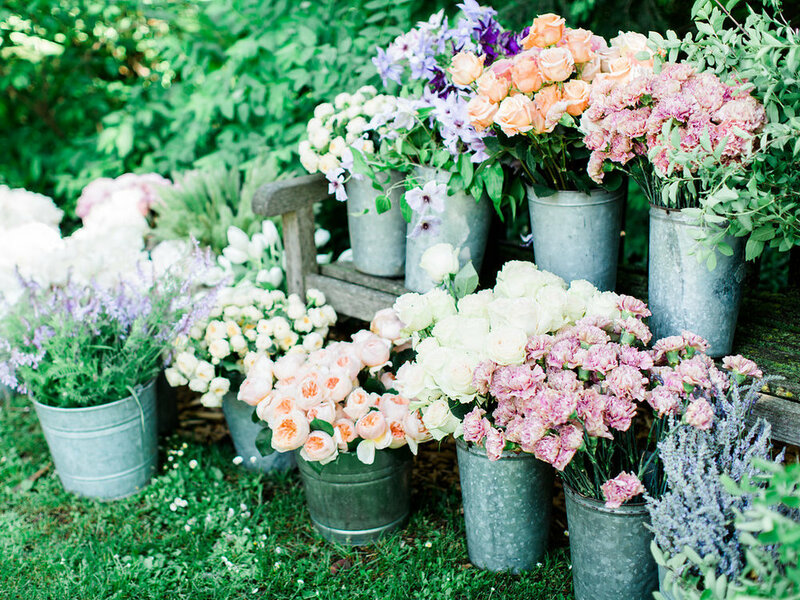 Leland was the perfect spring backdrop for this fun and inspiring workshop. 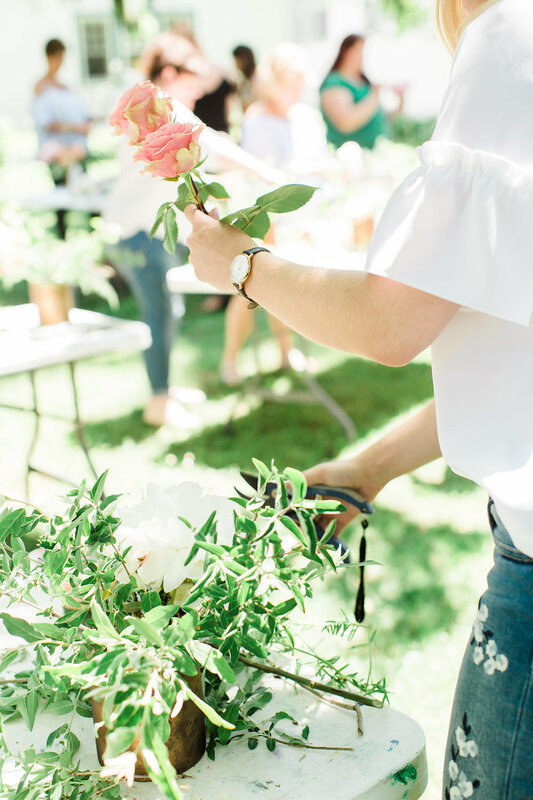 Everyone went home with not only gorgeous floral arrangements and a watercolor painting, but also new skills and knowledge to bring their businesses or next event to the next level. Look like something you'd love to be a part of? We would love to see you at our next workshop - at The Loft at Luna in vibrant downtown Grand Rapids, Michigan on November 21st. Follow the link to sign up for the "La Petite Bloom Holiday Hand Lettering Workshop". And don't forget to use code SABLEANDGRAY15 for 15% off your ticket! 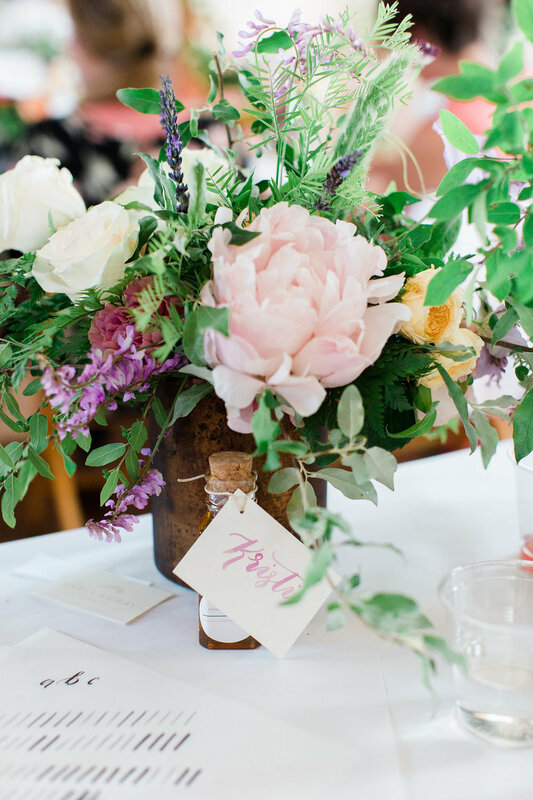 A huge thank you to Ashley Slater Photography for the stunning images of the workshop! On a gorgeous summer day on the coast of Lake Michigan, Katherine & Robert said their vows in a quaint chapel surrounded by close family and friends. 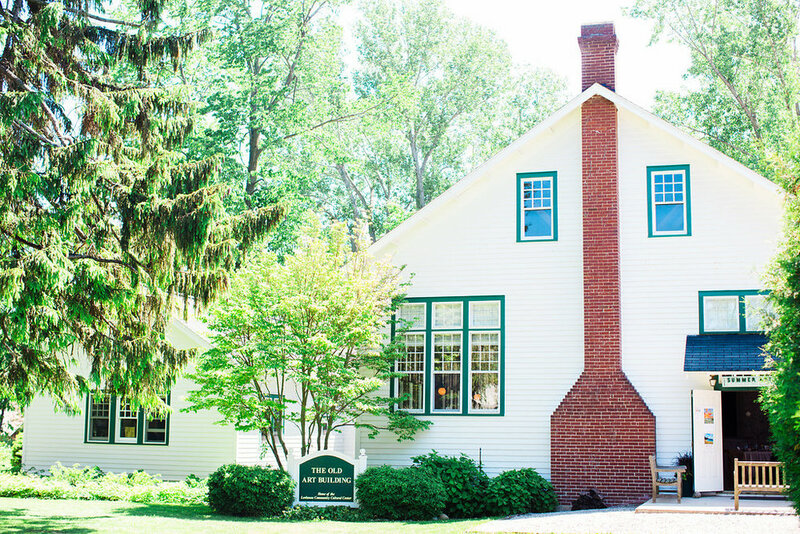 Their Leland, Michigan wedding was brimming with soft, romantic details paired with clean, classic design, and had small personal touches at every corner. The day was planned by the incredibly talented Sarah Rhodes-Boyce of Sincerely, Ginger Weddings and was photographed by the amazing Cory Weber Photography. We had the pleasure of working with the sweet couple on their custom wedding programs, which featured an original acrylic painting of the reception venue (The Leland Old Art Building) painted by the bride herself! I really love incorporating meaningful touches like these into our designs. The programs also featured a hand-tied silk ribbon in gorgeous pink tones which bound the pages together. We also created their adorable "Just Married" banner, which Katherine & Robert carried as they walked from the chapel to their reception venue, with their wedding guests in tow. 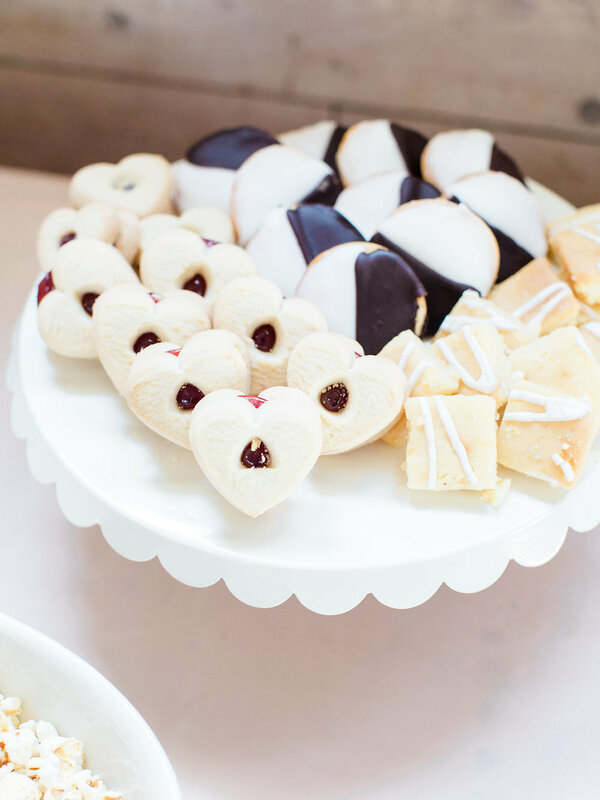 Their custom seating chart featured hand-lettered chalk guest names written on silver platters of different shapes and sizes, which were displayed on a table as guests entered their gorgeous tented reception. One of our favorite touches of the day? The custom wedding menus that we created for them that wrapped around each guest's loaf of bread on their place setting! Such a cute idea! Thank you Katherine & Robert for allowing us to be a small part of your big day! We wish you many years of happiness to come!